North Jersey Spine Group has dedicated its practice to providing renowned brain and spine treatment using a patient-centered approach. Our award-winning neurosurgeons, spine surgeons, pain management and physical medicine and rehabilitation physicians, have been educated at the top institutions in the country. Their vast experience ranges from diagnosing complex brain and spine conditions which require their operative care, to minor headaches or muscular back strain that can be treated non-surgically. Through knowledge, skill, motivation, and support, our patients successfully obtain optimal brain and spine health. Our compassionate group of experts educates patients on their diagnosis, explains the most effective treatment options and ensures patients understand their expected course towards wellness. Why See a Neurosurgeon for Your Spine and Brain? For spine and brain conditions requiring surgery, the value of an evaluation by a neurosurgeon is their rigorous training. A neurosurgeon studies the structural biomechanics of the back, including the bones, discs, and muscles, as well as the central nervous system which is responsible for the communication between the brain, spine, and nerves. Consequently, neurosurgeons are the only surgeons licensed to operate on, not just the vertebral bones of the back, but also on the spinal cord, its branching nerves, the blood vessels that supply the entire nervous system including the brain, and the brain tissue itself. With their definitive expertise, the esteemed physicians at North Jersey Spine Group philosophically take a conservative approach towards care. Every evaluation involves the consideration of whether a medically proven, evidence-based, non-invasive technique would ultimately treat the patient. Surgery is only offered once it is determined that it would be the best or only option for a cure or improvement to a patient’s condition. See What NJ’s Largest Spine Facility Can Offer You! 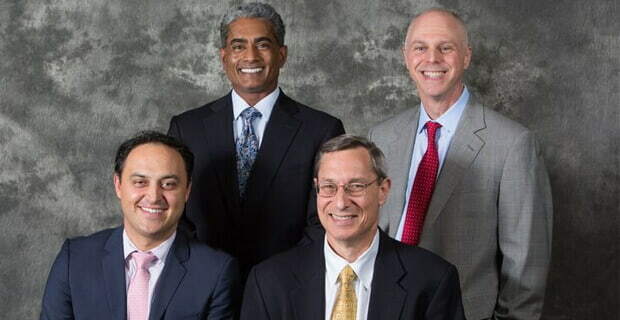 North Jersey Spine Group is the only spine center in New Jersey to be included in Spine Center Network, the only national listing of credentialed spine centers of excellence in the U.S.
Neurosurgeons are trained in the surgical treatment of the neck, back and nerves performing small incisions which result in less pain and a quicker recovery. Providing vast experience from evaluating minor cases to diagnosing complex conditions and performing spine surgeries. Experts in operating on the brain, spine and nervous system using an evidence based medicine approach. Specializing in the surgical treatment of brain tumors and vascular malformation. A wide range of non-surgical spine treatments providing pain relief techniques for patients. Advanced non-surgical treatments and therapies, can eliminate the need for surgery or supplement recovery when surgery is required. Spinal cord injuries can occur from trauma to the back resulting in the vertebrae, or discs pushing onto the spinal cord causing pain or loss of movement. Arthritis, as well as other bone diseases, can cause the deterioration of the bony structures surrounding the spine. This leads to back pain and difficulty with movement. For a torn or bulging disc to occur, there is often the history of an injury, accident, or a congenital structural abnormality of the spinal column. As there are many different interconnected structures that make up the spinal column, when they do not optimally align and articulate, spinal deformities, such as scoliosis form. The spinal cord originates in the brain as a bundle of nerves and extends throughout the back. Small nerves branch off and travel throughout the body. This nervous system is subject to tumor growth. Each type of brain tumor and its location within the brain has different implications with regard to treatment and expected outcomes. Brain neurosurgeons are experts at removing each type of brain tumor. The type of headache symptoms, location, and frequency experienced determines the treatment option offered. Occasionally it is necessary to correct a previous operation because of an unexpected stress placed on the back causing structural alignment changes. On each patient’s case, the highest caliber of board-certified neurosurgeons, recognized experts in spine and brain surgery, collaborate with a non-surgical team of physicians and physical therapists. Referring physicians, patients, adjustors, and nurse case managers across northern New Jersey trust the excellent team of doctors at North Jersey Spine Group for their care. Patients of North Jersey Spine Group can be seen conveniently close to their home or workplace as our offices span Bergen County, Hudson County, Essex County, Passaic County, and Morris County as well as nearby towns of Montclair, Jersey City and Morristown, NJ.